If you’re familiar with The Press Room Group, you’ll know that their forte is in casual, Brit-inflected bistro-type places. The Principal, however, steps out of this comfort zone and the resulting restaurant is the group’s most sophisticated – if not best – venture to date. Taking over the former Cinecittà space, the first thing you’ll notice here is the minimalistic design – a drastic change from the thematic interiors of, say, The Press Room or The Pawn. Then, if we draw your attention to the drinks list, wine director Kavita Faiella has put together an ‘atlas’ (literally) that lists more than 700 bottles sourced from all around the globe. If you’ve never tried Slovenian sauvignon blanc or Japanese pinot noir, this is the place to hit up. Still, the most impressive thing here is the food and The Principal offers dishes prepared with a refined haute cuisine aesthetic. Imagine bite-sized pieces of smoked eel ($190) garnished with herring roe then carefully arranged around blocks of aloe vera jelly and tomatoes cooked three ways. A quenelle of pineapple ice cream sits in the centre of the plate over a shallow pool of palate-cleansing fennel sauce. It’s a colourful canvas of contrasting textures, temperatures and flavours. The crab starter ($215) is done with equal finesse, comprising of minced crabmeat and snipped chives mixed with pear and ginger chutney before being sandwiched between two wafer thin sheets of celeriac. The only thing we object to here is the small cup of crab ‘tea’ chaser, which tastes like a watered down shellfish bisque. While the menu draws from various cultural influences, The Principal is not defined by any one particular country. The crisp-skinned ‘cochinillo’ suckling pig ($295) is a nod to executive chef Jonay Armas’s Spanish heritage (Armas hails from the Canary Islands). Here, it’s slow-cooked, seared then plated with pomegranate reduction and an insanely delicious lemon purée. The grilled Kobe ($540), on the other hand, combines Asian ingredients with French execution. 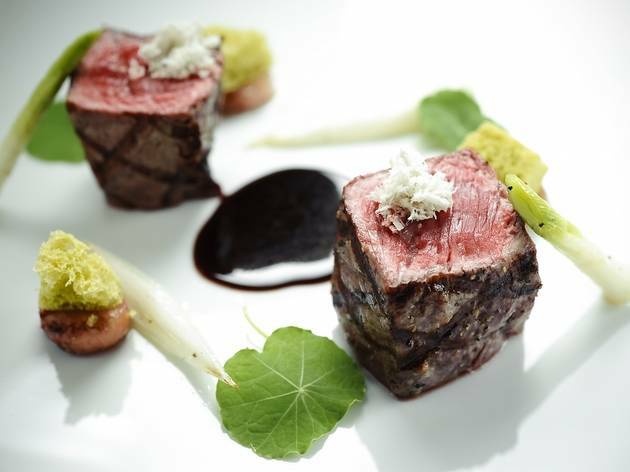 The intensely marbled meat carries a buttery flavour that pairs delightfully with the sweet crumbs of black garlic scattered around the plate. But it’s not just the beef that shines; a side of young sorrel leaves and lightly sautéed turnips and baby carrots boast the sweetness and crunch of fresh-out-of-the-soil veggies. And then there’s the foie royale – a gelatinised mixture of duck liver and cream with a delicate texture contrasting with its rich flavour profile. 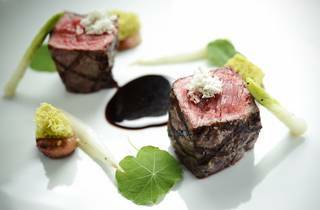 If you don’t want to splurge on the Kobe though, the beef sirloin ($365) works just as well. It arrives as thick cuts cooked to a gorgeous medium rare accompanied by horseradish sauce. Jelly-like blobs of bone marrow hide under baby leeks and shallots, fully absorbed with the savoury essence from the meat jus. Brilliant. For desserts, go for the ‘passion fruit’ ($115) – a balanced formula of fruit syrup and crumble served with white chocolate curd and ginger ice cream for a gentle kick. We prefer this over the ‘coffee & caramel’ with hazelnuts ($115), which tastes flat in comparison. 9 Star St, Wan Chai, 2563 3444; www.theprincipal.com.hk. Mon-Sat midday-3pm & 6pm-midnight. Closed Sun.